ALZA Corporation was a pharmaceutical and medical systems company. Founded in 1968 by Dr Alejandro Zaffaroni; the company's name is a portmanteau of his name. ALZA was a major pioneer in the field of drug delivery systems, bringing over 20 prescription pharmaceutical products to market, and employing about 10,000 people during 20 years. In 2001, ALZA was acquired by Johnson & Johnson via a stock-for-stock transaction worth US$10.5 billion. 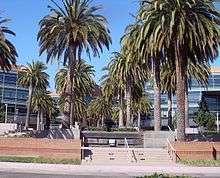 ALZA built its first corporate headquarters in 1971, at 950 Page Mill Road in Palo Alto, California, now occupied by law firm Wilson Sonsini Goodrich & Rosati. In 1999, ALZA moved its headquarters to Shoreline Business Park, where it remained until July 2007 when ALZA was acquired by Johnson & Johnson and the space was vacated. The remaining employees were relocated to two buildings elsewhere in the Shoreline Business Park. ALZA is now in operation in Vacaville, California. Google's Googleplex is located just east of ALZA Plaza. In August–September 2008, Google moved into the ALZA plaza buildings. ALZA operated a large-scale manufacturing facility in Vacaville, California and previously operated a large-scale facility in Cashel, Ireland. ↑ "Johnson & Johnson to Merge With ALZA Corporation In $10.5 Billion Stock-for-Stock Transaction" (Press release). NEW BRUNSWICK, N.J. and MOUNTAIN VIEW, Calif: Johnson & Johnson. Johnson & Johnson. 2001-03-27. Retrieved 2015-07-10. ↑ Gareth Macdonald (28 April 2009). "Patheon to make Oros-based depression and allergy drugs". Decision News Media SAS. ↑ Center for Drug Evaluation and Research (1995-05-09). "Approval Package For: Application Number: NDA 20-021/S-003" (PDF). Retrieved 10 July 2015. ↑ "Bayer to Market ALZA's Viadur(TM) in U.S." (Press release). MOUNTAIN VIEW, Calif., and WEST HAVEN, Conn.: PRNewswire. PRNewswire. 2000-04-05. Retrieved 2015-07-10. ↑ "Marketing of Viadur(R) (leuprolide acetate implant) to Phase Out by April 2008" (Press release). WAYNE, N.J.: PRNewswire. PRNewswire. 2007-12-20. Retrieved 2015-07-10. ↑ Simonson, Sharon (26 August 2007). "''ALZA's exit could mean another office space buy for Google'' - Silicon Valley/San Jose Business Journal". Sanjose.bizjournals.com. Retrieved 2011-07-29. ↑ "''ALZA Corp. leaving city after 17 years'' - Mountain View Voice". Mv-voice.com. Archived from the original on 24 July 2011. Retrieved 2011-07-29. ↑ "'Devastating' Jobs Blow for Cashel and Tipperary with Closure of Alza/Cordis Plant". Retrieved 2016-11-07.